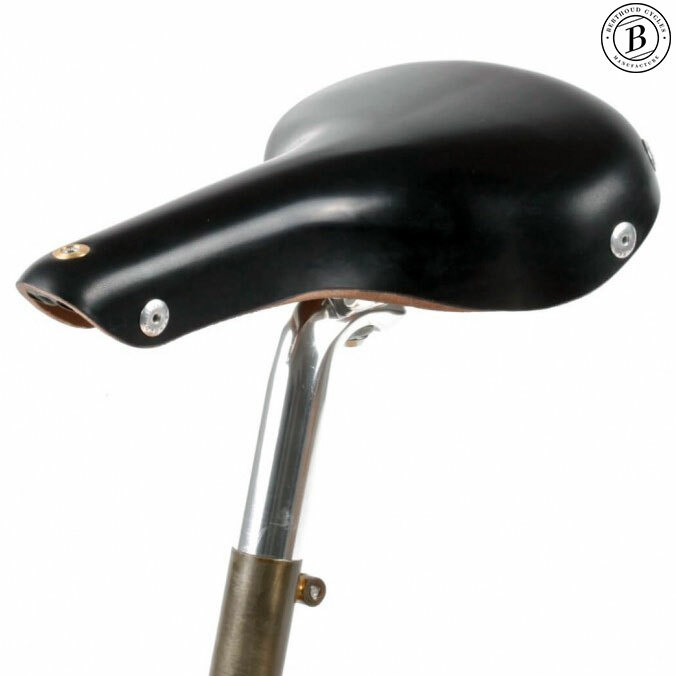 The saddle top is made of thick, natural vegetable tanned leather that has been pre-softened and waterproofed. This is attached to the rear of the frame to position the rivets away from the rider. The saddle's width of 180mm is ideal for commuters and tourists who might prefer a more upright position. Length is 278mm. The weight, which varies a little due to the leather, is approximately 510g. The rear crescent is made of a strong technically advanced material that is both stable and flexible for maximum comfort. Loops are built in to accommodate a saddle bag. Polished stainless steel spring is used for the rails. These have long parallel sections to give ample room for adjustment. A special tension system, adjusted with a 5mm Allen key, prevents the nose from twisting. Can you get this saddle (Gilles Berthoud, Mente) in brown?? Unfortunately we only do this saddle in black.